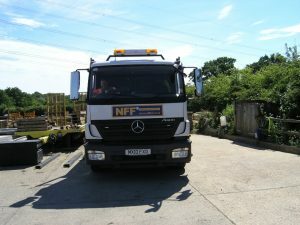 Newton & Frost Fencing Ltd based in Horam in East Sussex has been providing a quality service to the construction industry in the UK since 1976.Throughout this time we have established a reputation for delivering installations with the focus on best value, quality, safety and meeting programme requirements. Our industry experience ensures our installations comply with both the rigorous specifications required and satisfy the expectations of the client. In order to be able to offer our clients the best value service that they can hope for, our company has invested in approved management systems that benefit both us, and our customers alike. By creating dedicated management systems covering quality, health and safety, and environmental issues, we have provided a product/service that is monitored throughout the duration of each process, and where shortfalls are highlighted, as a result, we are continually improving our systems, and ultimately our service, explains Steve Cheeseman our Transport Manager. All our drivers have completed their Safe Urban Driving course. We have also invested heavily in vehicle safety systems cameras, nearside proximity sensors and audible alarms for all our vehicles. All our drivers have also completed FORS E-Learning modules. We have managed to improve our MPG year on year for the past 4 years. We achieved this by making sure we always selected the best route possible to all our sites and we plan ahead before leaving the yard. We also reduced our parking fines and charges by 100% in the past 12 months. 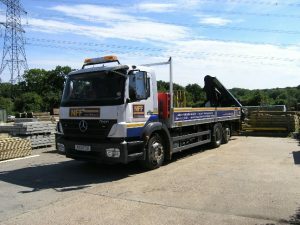 We carry heavy landscaping products to and from construction sites across the whole country. We move anything from a digger to a building materials As we rely on our customers asking us to collect or delivery equipment/ products from various construction sites across the whole country, we never know where we are going until they need us. Therefore we can’t afford to try and move anything via barge or train as we collect all the equipment from building sites and there is no other method available, other than using a lorry. We are required to deliver anywhere in the country making any other mode of transport (other than a lorry) impractical. We do however have a transport logistics department who insure that haulage runs are kept to a minimum and journeys are combined whenever possible, therefore using a lorry is the most cost effective way of moving our client’s goods. We are in the process of replacing all our lorries with Euro 6 engines while maintaining a reasonable cost base for the business. We have looked at electric vehicles but because of the weights we carry and the fact that our lorries have specialist equipment fitted, no manufacture has yet produced an alternative fuelled vehicle that can carry the weight we do and go over the same terrain we do. This is a market we will continue to monitor, making sure we are best placed for when suitable vehicles are available.